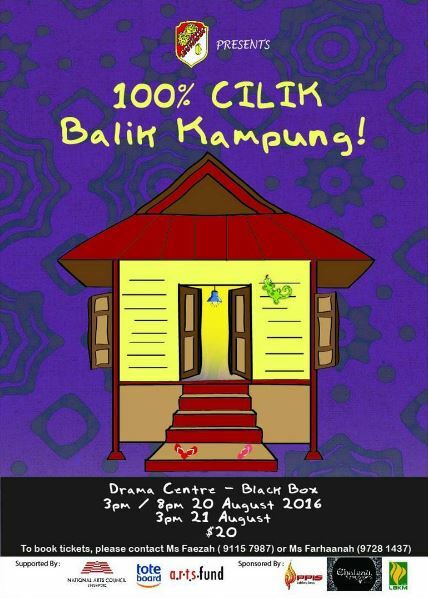 SRIWANA proudly presents “100% Cilik – Balik Kampung” this 20th – 21st August at the Drama Centre Blackbox. “100% Cilik – Balik Kampung” depicts a story of Aqil, a city boy, who returns to his village, typically known as a ‘kampung’ where he meets old friends and learns more about the Malay culture. Together with two other friends, Talib and Khai, the trio immersed themselves in the daily routines of a ‘kampung’ boy – kite-flying, teasing, catching and many more! For boys of their age, it is common to go through a once-in-a-lifetime circumcision ceremony- ‘Majlis Khatan’. Unfortunately, none of the trio knew who will be the ‘target’ this time round. Will it be Talib, the one who seems the most prepared since he knows all about ‘Majlis Khatan’? Will it be Khai who seems afraid since he stutters a lot? Or will it be Aqil since he returned to the ‘kampung’ at a very timely occasion? This all-children production allows a two-way learning – the city boy reliving the life in ‘kampung’ and at the same time, introducing the city life to the ‘kampung’ children. With engaging art forms such as theatre, music and dance, this production hopes to allow children of today the opportunity to virtually experience what it is like to go through circumcision amidst the chaos in the village. Such ceremonies, held in congregation and often in the eyes of the public in ‘kampung’ is a contrast to how such ceremonies are held today. Sriwana also hopes to nurture such curiosity amongst children and plant their interest in appreciating the Malay culture and tradition. So what are you waiting for? Please call Ms Faezah at 9115 7987 or Ms Farhaanah at 9728 1437 for tickets and enquiries. Thank you for your support and we look forward to see you!